Born on February 11th, 1992 in Grand Rapids, Michigan, Taylor Daniel Lautner has shown he was destined for a successful life from a very young age. He began studying karate at the age of six, training at Fabiano's Karate School, and by the following year, he was already winning tournaments. When he was eight, he was asked to represent his country in the twelve years and under division in the World Karate Association where he proved himself by becoming the Junior World Forms and Weapons champion, winning three gold medals. He continued to flourish in the martial arts circuit; in 2003, by the age of twelve, he had three Junior World Championships under his "black belt". In his spare time, Taylor loves playing football and baseball, both sports which he is very strong in. In football, he running back on offense and middle line backer on defense and, in baseball, he takes part in the Hart Baseball Program where he is positioned at center field and second base. He also participates in the LA Hip Kids, a hip-hop dance group. Taylor also enjoys making home movies with his friends, including 'Sharkboy and Lava Girl' co-star Taylor Dooley, who coincidentally lives near his Los Angeles home. Although, he wants to continue acting into adulthood, he wouldn't mind becoming a film scriptwriter and director. Stewart was born and raised in Los Angeles, California, where she currently lives with her family. In a 2008 interview with Vanity Fair, Kristen confirmed she is dating actor Michael Angarano. She is also very close friends with her Twilight co-stars Robert Pattinson and Nikki Reed. Stewart has expressed a desire to live and work in Australia, saying, "I want to go to Sydney University in Australia. My mom's from there." Apart from acting, she is also interested in attending college in the near future, saying, "I want to go to college for literature. I want to be a writer. I mean, I love what I do, but it's not all I want to do—be a professional liar for the rest of my life." To date, Stewart's most critically acclaimed role may be in the television film "Speak" (2004), based on the novel by Laurie Halse Anderson. Stewart, thirteen at the time of filming, played high school freshman Melinda Sordino, who stops almost all verbal contact after being raped and who deals with enormous amounts of emotional turmoil. Stewart received great praise for playing the character, who had only a few speaking lines, but kept up a dark-witted commentary inside her head throughout the film. In 2005, Stewart appeared in the fantasy-adventure film "Zathura", playing the role of Lisa – an irresponsible older sister of two little boys, who turn their house into a spacecraft hurtling uncontrollably in outer space by playing a board game. The movie received praise by critics, but Stewart's performance didn't garner much media attention as it was noted that her character is immobilized during most of the movie. The following year, she played the character Maya in "Fierce People", directed by Griffin Dunne. After that film, she received the lead role of Jess Solomon in the supernatural thriller movie The Messengers. In 2007, Stewart appeared as teenager Lucy Hardwicke in "In the Land of Women", a romantic drama starring Meg Ryan and The O.C. star Adam Brody. The movie, as well as Stewart's performance, received mixed reviews. That same year, Stewart starred in Sean Penn's critically acclaimed adaptation film Into the Wild. For her portrayal of Tracy – a teenage singer who has a crush on young adventurer Christopher McCandless – Stewart received generally positive reviews. Salon.com considered her work a "sturdy, sensitive performance", and the Chicago Tribune noted that she did "vividly well with a sketch of a role." On November 16, 2007, Summit Entertainment announced that Stewart would play Isabella "Bella" Swan in the movie Twilight, based on Stephenie Meyer's bestselling vampire/human romance novel of the same name. Stewart was on the set of Adventureland when director Catherine Hardwicke visited her for an informal screen test which "captivated" the director. Twilight was released domestically on November 21, 2008. Stewart will be reprising her role as Bella in the sequel, New Moon, in 2009.
Who are you most excited to see when you get up to Vancouver? K.S. : “Taylor Lautner!” screamed the woman who supposedly romanced—onscreen and off—mega-vamp hunk Rob Pattinson. 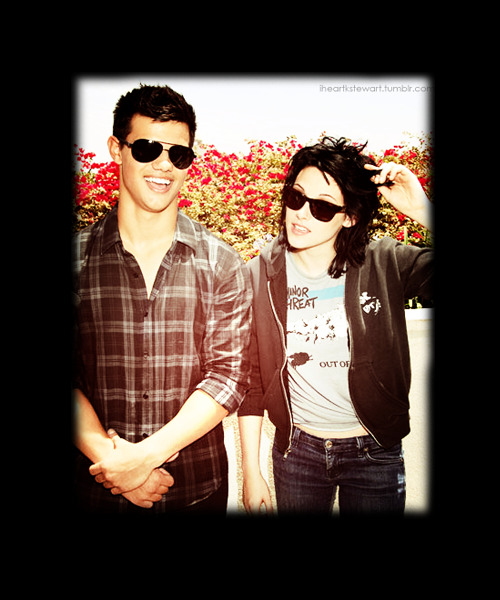 “[Lautner]’s still playing Jacob and that’s, like, the coolest thing.” Stewart practically drooled. “He’s buff, too. 'Cause that’s so important,” she added sarcastically, as if that snap-save was going to throw us off one damn bit. And about her new buff Jacob, she admits that those new muscles are pretty hot. "He's jacked," Stewart says with a smile. "It's crazy." He did some serious gym time. He's an entirely different person physically and he's also, it took him so much time, so he's devoted. He's amped. He's really excited." K.S. : "We're so proud of him. he's like..he's literally devoted his entire...his entire..last...like ...you know..
And not just physically its like... he's gotten buff and everything, but he's so in it." Rachelle LeFevre, who plays Victoria, thinks Taylor will bring something special to New Moon. "Taylor's very serious about forming a connection with Kristen," she said. "He'll make sure his relationship with her is just as intense and has just as much chemistry as Rob's. I think Rob should watch out!" Now that Taylor Lautner has been re-cast in the role, however, she's convinced that they can make it work. "Yeah, absolutely," Stewart said. "I'm so glad they didn't have to find somebody else; we already had him! I didn't understand all the deliberation on [whether to bring him back]. But now that it's set, we can all rest." "He's really buff!" she exclaimed of Lautner, who's packed on nearly 30 pounds of muscle so far to prepare for Jacob's werewolf growth spurt. "He definitely is. It took him a lot of time." T.L. : "Kristin is a beautiful girl and she's an amazing actress and an amazing person, so it was great chemistry." Do you like her as blonde now?